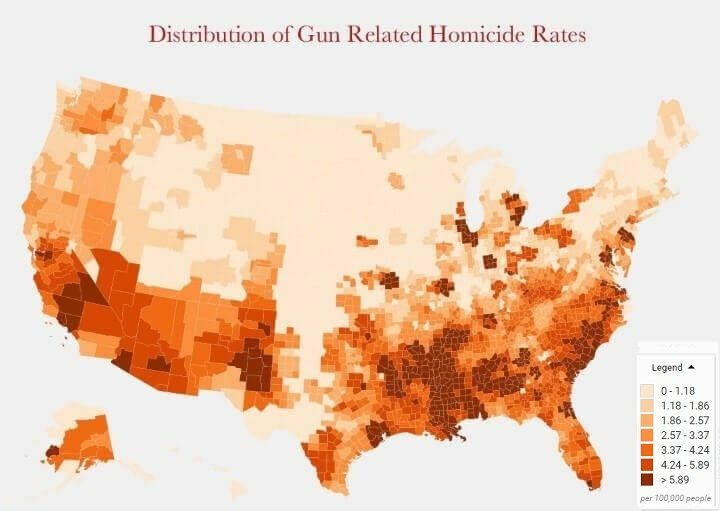 The point is, again, the areas where legal ownership is restricted always have consistently high rates of gun crime, which the laws purportedly are supposed to prevent, but do not. Instead, you end up with citizens living in areas where gun policy works against them but does nothing to deter criminals...it's easier for criminals to get guns in Cook County (Chicago) that law-abiding citizens. Same goes for pretty much every major urban area. Now guess what the governments of those areas all have in common. You will find the same pattern in the stats, thought I appreciate the difference. That is why my ball park stats earlier had lots of ranges and caviates, there are roughly one no homicide death for every homicide. good catch, Suicide is the same no matter where you go. in fact there a lot of countries that have zero gun ownership that have suicide rates through the roof. No you won't. suicide skews the averages a lot. more people commit suicide than harm others through murder. I appreciate the difficulties of trying to do gun control at local levels, I also appreciate that other factors such as gang culture, drugs, urban deprivation can has a large an effect as gun control. That's why i prefer to look at comparing the UK and Europe to the states, than between differences in different US cities & states even though there may be greater cultural differences. I can't see how city or even state wide gun control could work, when guns just move across state and city borders. Did you see the map I just posted above? Some changes but not massive. The big cluster is the south and south west, not in the urban areas. A quick look at a few stats i've seen UK suicide rates at 7.2 to 10.8 per 100,000, and US and 12.8 per 100,000. It doesn't swing the stats like you think it does. are we looking at the same map, all the dark red areas are on top of major population centers. it does, in countries where gun ownership is higher people use a gun as the preferred method of suicide, so it skews gun deaths significantly. I'd agree when looking at a raw numbers homicides is a better figure to use. In the last few years the UK has been running at 50 - 60 gun homicides per year, the US 8,000 to 10,000 and the numbers thankfully dropping. Once you adjust that for population differences, it will be 300 to, 8,000 to 10,000. I find this sites good for raw stats which aren't skewed by either side of the arguement http://www.gunpolicy.org. Anyway i'm off to bed, stay safe all. A woman screamed at a crowd of Las Vegas concertgoers that they were “all going to die tonight” just 45 minutes before a gunman opened fire, killing at least 50, according to a concertgoer interviewed by KSNV, NBC’s Las Vegas affiliate. Brianna Hendricks, who attended the Route 91 Harvest Festival with her mother to celebrate her 21st birthday, described the moment a woman screamed “they’re all around…you’re all going to ****ing die today,” as reported the Daily Mail. At around 10 p.m. Sunday, 64-year-old Stephen Paddock fired on concertgoers during a during a performance by country musician Jason Aldean. Police said more that 50 people were killed in the attack — with over 200 injured — making it the deadliest mass shooting in U.S. history. Paddock was later shot and killed in a hotel room at the Mandalay Bay Hotel and Casino by police.